Last week was social media week in London, due to my exceptional attention to detail (and the fact that I was organising an event during the week for my job) I spotted a really interesting food photography workshop happening as part of it. The workshop, hosted by Great British Chefs at Google’s offices featured dishes cooked by Michelin starred chef from Pascal Aussignac and brilliant photography advice from David Griffen. After a talk from David we were split into groups based on camera and dishes from Pascal were brought out for us to photograph and of course eat! I’ve posted photos unedited (L) and edited (R) so you can see how they came out and what you can do in post processing to lift your images. Everything was photographed in artificial light, with my Canon Ixus compact camera. 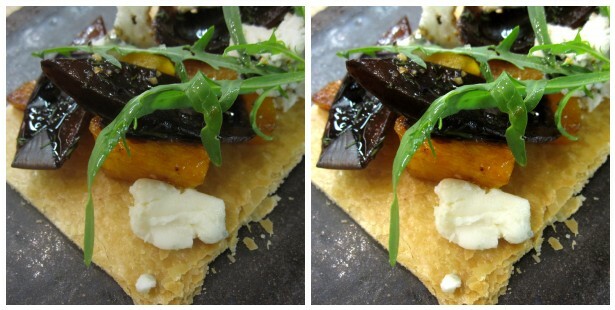 I edited the photos in Picasa, mainly just lightening up, highlighting, cropping and a bit of shadow in places. 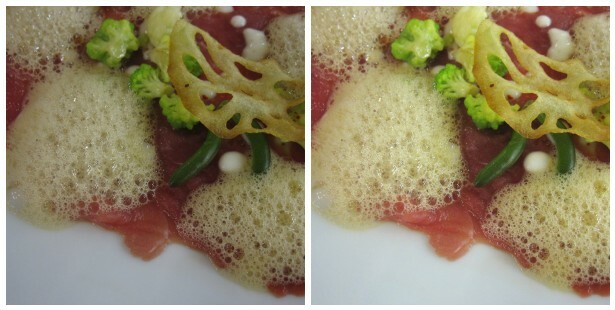 A dish premiered at the event. 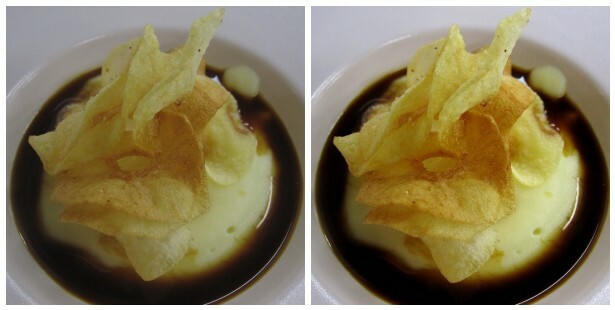 Duchess of Marmite – duchess potatoes, marmite sauce, potato crisps. Quite strong on the marmite taste, even for a lover of marmite like me, but a great idea. The workshop was really worthwhile for all levels, I found that I was ignoring all the skills I’d learnt about taking pictures of jewellery, they apply to food! Get a cheap £10 reflector (or try foil wrapped around cardboard), get in CLOSE to take your pictures and move the dish around to get the best light on it. I also took a pretty awesome picture of the last dish on my iPhone, you definitely don’t need a big fancy SLR to take great pictures, and mobile phone cameras are obviously better to use in restaurants and cafes. The workshop is held every year so keep an eye on the social media week site next September, and Great British Chefs is also a great site with loads of fantastic recipes and inspiration – from chefs and bloggers.